Earl’s Chocolate Pie is from one of my new Christmas presents, “Sharing Our Best” by the Volunteer Auxiliary of Palmetto Baptist Medical Center. Todd bought it for me because we both appreciated the hand-drawn circle around this recipe. 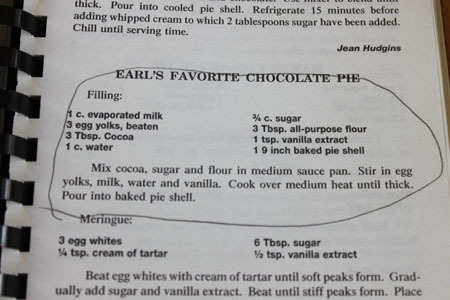 If anyone knows Earl, please tell him he has great taste in pie. This is good pie. While I did make a couple of adjustments (a pinch of salt and a dab of butter), all credit goes to Earl’s friend/child/acquaintance who donated this recipe to the collection. On paper it’s a pretty basic recipe and not as flashy and rich as some of my other chocolate pies, but for a quick fix and very satisfying (3 tablespoons of cocoa powder goes a long way here!) it was terrific. One thing that really stood out in this pie was the stiff, slick, smooth texture which may have come from the evaporated milk/water combo. And like I just said above, 3 tablespoons of cocoa was fine. I used Valrhona for this pie, so it had a pretty distinctive flavor, but I think it would be fun to test it with other cocoas as well. And finally, please ignore the meringue in this photo because I messed it up and used 2 egg whites instead of 3. I kept wondering why my meringue was less voluminous and kind of sweet, then while the pie was baking, I found the egg white I’d forgotten to throw into the stand mixer bowl. Luckily, the meringue still tasted pretty good. Update: Over the years Earl’s Chocolate Pie has become one of my favorite recipes. The key is using a good quality cocoa powder. Whisk the egg yolks together in a bowl and set next to the stove. In a medium saucepan, mix together the sugar, cocoa powder, flour and salt. Whisk in the beaten egg yolks and a little of the milk, mixing until smooth. Turn heat to medium and whisk in remaining milk and water. Continue whisking until mixture bubbles and thickens (this took me about 8 minutes since I started with cold ingredients). When mixture bubbles, continue whisking for another 2 minutes. Remove from heat and whisk in the butter and vanilla. Pour the mixture into the baked pie crust and quickly make the meringue. You want to spread the meringue on the pie filling while it’s hot. In bowl of a stand mixer (or regular mixing bowl), beat the egg whites and cream of tartar until soft peaks start to form. Slowly beat in the sugar and continue beating until peaks are stiff. Beat in the vanilla. Spread meringue across the pie. Bake at 350 degrees F for 10 minutes or until meringue is nicely browned. Cool at room temperature for about an hour then transfer to refrigerator and chill for a few more hours. I used to make a pie similar to this. Looks wonderful! Those are such fun recipe books, the good ol’ homemade ones. Love the drawn circle, too. Makes it hard not to pick that one as a first to try from the book. That looks pretty dang good Anna! 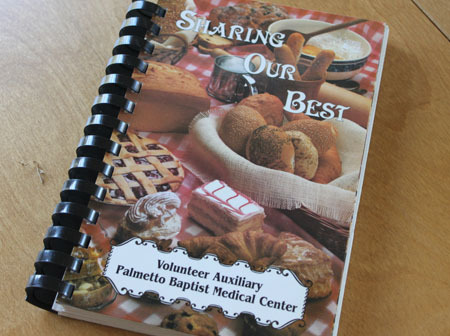 Those collaboration cookbooks can be real crapshoot. I have tried recipes from quite a few and sometimes they are good, sometimes they aren’t. Glad this was one of the good ones! 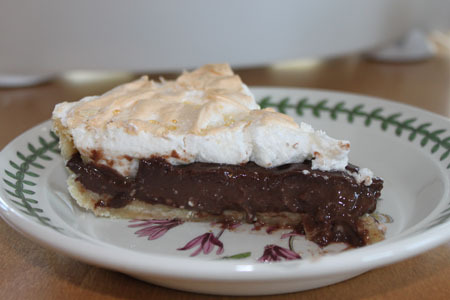 I love chocolate pie – I’ll give this one a try soon! well 3 egg yolks will make anything decadent. just mention the word chocolate and you’ve got my attention! 🙂 this pie looks absolutely incredible!